or download from my iDisk. I hope to get time to listen to and edit the second part later this weekend. On Tuesday I was at TeachMeet Falkirk_09, we had a great night. As usual I was amazed at the amount of work put in by the organisers lead by Margaret Vass and folk from Falkirk. This time I had the honour of MCing the meet. This was particularly nice as I was not involved in all of the hard work. It did mean that I didn’t really fully concentrate on what the presenters were saying, as I was trying to thing about what I was doing and saying. I did gain a lot of great ideas form the presenters and am currently working my way through the FlashMeeting audio. 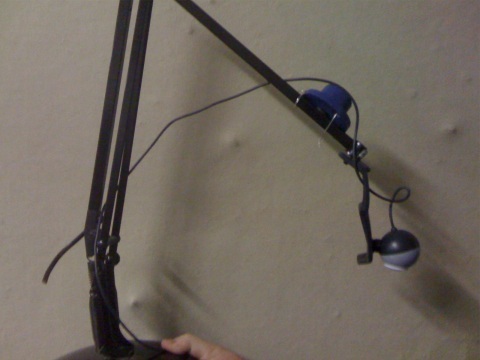 It is hard to pick out any particular presentations, but for me, Nick‘s Webcam desktop visualiser (pictured above) embodies the DIY aspects to TeachMeet. Margaret had asked me to talk a wee bit about how TeachMeet started, on listening to the meet I realise that I might not have been to clear or informative, concentrating more on the fun and Guinness rather that the principles. I hope to remedy that in a blog post soon. In the run up to Falkirk there was some discussion about the ‘rules’ of TeachMeet and they were tweeked a little. As I prepared to talk about the history of TeachMeet I realised that the rules are not really rules. There is a perception that these are fixed, but over the early TeachMeets at least they changed to fit the event. A while back John Connell posted Time For A TeachMeet Alternative? and generated a lot of discussion (Be sure to read TeachMeet Alternatives: follow up on John’s blog too). As TeachMeets are organised by whoever has the energy and good will it doesn’t really matter if you don’t like the format: you can change it. The power of TeachMeets is not, for me, the format but the proof that people can organise and share in a way that is not top down. I took quite a few photos at the event but was let down by my lack of photo skills, my iphone photos turned out better. Mark Rushton has published a nice set on Flickr: #TMFALKIRK09 Pics and hopefully some more will turn up tagged tmfalkirk09. Margaret blogged: A Successful Falkirk TeachMeet! including the gist of her presentation. I hope that most of the presenters will post details, or links to their presentations. I also am hoping that a few folk might use edutalk to podcast a reflection or review of the event. I am going to go and post these links to the wiki, please do the same for any others or leave a comment (or tweet me) here and I’ll do it.